Nelson “Madiba” Mandela, the first democratically-elected President of South Africa, has been a beloved figure for decades, and his death drew an outpouring of grief all over the world. But few of us know much about the South Africa that he helped to radically change. Wanting to learn more about life in South Africa–and especially about missions and Orthodox Christianity- before and after the fall of apartheid, I have asked Father Deacon Stephen Hayes to answer some questions. While converting to Orthodox Christianity in the mid 1980s, Fr Dn Stephen and his family participated in founding the Society of St Nicholas of Japan with the aim of promoting the Orthodox Christian faith among people of all ethnic groups. Fr Dn Stephen remains active in missionary work, participates in a number of internet discussions on Orthodoxy and missiology, and continues to supervise post-graduate students in missiology at the University of South Africa. His blog Khanya has articles on Orthodox missiology, the history of St Nicholas parish, and other topics. Father Deacon, what was apartheid? How did life function under it? I think the best way I can answer that is to refer to a series of posts I wrote on my blog, to answer that question, and similar ones. The series is called “Tales from Dystopia”, and you can see it here. In what ways is your day-to-day life different today than it was before 1989? In some ways very little. We live in the same house, we travel around in much the same way. But there is a better feeling about it. There is no longer the feeling that someone is watching over your shoulder to see who you meet, who you talk to, listening to your phone calls, opening your letters (especially ones to foreign addresses). Is there any link to be made between President Mandela himself and Orthodox Christianity? Not much. He was a Methodist, but he welcomed Orthodox bishops (and the Pope) when they visited him. Is there any link to be made between the anti-apartheid movement and Orthodox Christianity? Again not much, except that in Orthodox Christianity phyletism (racism) has been declared a heresy. Most Orthodox Christians here have been immigrants, and therefore not much concerned about local politics outside their ethnic communities. To you, personally, is there a link? Very much so, but that was because, even before I became Orthodox, I saw that the apartheid ideology was directly opposed to many fundamental truths of the Christian faith. As a Protestant might express it, it was salvation by race, not salvation by grace. From an Orthodox point of view, any ideology that says that belonging to a group of people who have the same skin colour as you is more important than belonging to a group of people who were baptised into Christ with you is, ipso facto, heretical. Should I be calling this the anti-apartheid movement, or would use use a different term? It was usually called the anti-apartheid movement in other countries. But inasmuch as apartheid was the policy of one political party, most other political parties and groups were against it to a greater or lesser degree. My generation–North Americans who came of age in the 1990s–know of Nelson Mandela only as a symbol of kindness, graciousness, and reconciliation. I myself think of him in the same category as Mohandas Gandhi or Martin Luther King, Jr. We hardly see him as a person, but mostly as a picture. We also have very little sense of what the anti-apartheid movement (and post-apartheid life in South Africa) looked like beyond the person of Mandela himself. What can you tell us to give us a better picture of Mandela himself as a human rather than a symbol, and what can you tell us to give us a broader picture of South Africa beyond the person of Nelson Mandela? As our bishop said when he urged every parish in the diocese to hold a requiem for him last Sunday, he stood for justice, peace and freedom. For me, it is above all freedom. But unlike Gandhi, or even Martin Luther King, he was a disciplined member of a political movement that he regarded as bigger than he was. There are good points and bad points about that. Since the ANC came to power, the movement has been infiltrated by people who have been seeking to use it for personal advantage. I think it happens in America too, and I think you have a word for it — “pork barrel politics.” There has been a lot more of that since he retired, and I think it has been growing. Will you say more about how you see Mandela standing for freedom above all? My main memory of that period was that the ANC, in particular, seemed to be taking one of their own slogans seriously — that “the people shall govern”. A lot of energy and effort was put into soliciting public opinion and ideas on all kinds of things, from the content of the constitution to the promotion of education, art and culture. Conferences were held, submissions sought, and many of these things were subsequently incorporated into the constitution. There was a feeling of “inclusiveness” in the best sense. If there were to be leaders, the leaders must be sensitive to the needs of the people, and must listen to the people. There was a Zulu proverb, that a chief is a chief because of the people. So there was a ferment of ideas, and a feeling that anything was possible. This inclusiveness of was not the ideological western kind, but part of the African idea of ‘ubuntu’. But Nelson Mandela, in particular, had a vision of a free and democratic South Africa, and part of that vision was that people should be free to say what they thought freedom should be like. As late as the 1980s, many people in the United States viewed the anti-apartheid movement in general- and Mandela in particular- as either terrorist or Communist or both. The ANC wasn’t officially removed from the United States’ terrorism watch list until very recently. Given the European (and Ethiopian) context which associates Communism with violent anti-religious persecution, targeted particularly on terrorizing Orthodox Christians, what do these ideas have to do with the reality of the anti-apartheid movement and with Nelson Mandela himself? For people in South Africa, the apartheid regime tried to scare us by saying that anyone who opposed them was “communist”, but in fact there was little to fear from a communist takeover, because we already had the most fearsome features of communist regimes — secret police, detention without trial, an authoritarian state system, persecution of Christians (except for the government-approved varieties, which enjoyed special privileges). The ANC was (and still is) allied to the Communist Party, but since they came to power, we have had a democratic constitution that guarantees freedom of religion, and that part of the constitution was drawn up by a communist lawyer (Albie Sachs, you can Google him) who invited the widest participation of religious groups in drawing it up. You see, in South Africa, most persecution of Christians came from the ANTI-communists. Would you give one or two brief examples of persecution of Christians under apartheid? You can find a couple in my “Tales from Dystopia” and also here and here. When reading South African history, we sometimes hear of people having been ‘banned.’ What does it mean to be banned? Were you ever banned? How does it affect a person’s life? I’ve got a web page on that, which should tell you most of what you want to know, and also one of the “Tales from Dystopia” series. I was banned from 1972-1976. Does South African history have something to tell us about love for enemies? Our struggle, as St Paul says, is not against blood and flesh. The people who advocated and enforced apartheid were not uniquely evil — they were slaves of an evil system, and needed to be free. And I immediately thought, who said that? Did I say that? Where did that come from? And then I realised that it must have come from the Holy Spirit. It certainly wasn’t something I was thinking of. A common theme among North American Christians is that Christians–and especially the Church as a body–should be apolitical. In the United States, the notion of ‘separation of Church and State’ is sometimes taken as an Eleventh Commandment. Does organized political involvement by the Church or by Christians–especially perceived leftist political action such as liberation movements–contradict Christian belief? What about armed struggle? Do politics, by their nature, pollute Christianity? some of his associates were called “terrorists” by the British. Another, in a different time and place, was St Sergius of Radonezh. I’m inclined to be pacifist, and am not too keen on “armed struggle”, but I recognise that not everyone shares that point of view. Americans have the example of George Washington, who was leader of an armed struggle, and so was probably just as much a terrorist as Nelson Mandela. But if a Christian’s conscience allows him to take part in an armed struggle he should always remember that military power is the power that is most susceptible of all to abuse, and be alert to the danger of its abuse, whether by himself or others. When I hear about South African politics and South African church life, I frequently hear the term ‘ubuntu’. What is ‘ubuntu’? ‘Ubuntu’ is a Zulu word that means “humanity”, the quality of being human, and humane, and seeing other people as people and not as things or objects to manipulate. etc. And Hamilton said, “You don’t just throw a person away.” That’s ‘ubuntu’. Whether it’s an unborn baby, or a youthful drug addict, or a middle-aged AIDS victim, or an old person with Alzheimers, a prostitute, a banker or a terrorist — you don’t just throw a person away. Jesus didn’t. And that’s ‘ubuntu’. People like to talk a lot about ‘ubuntu’, but there’s not much of it around these days. I have some experience of ‘ubuntu’ decision-making in the Tanzanian context, although that particular terminology isn’t used. It strikes me as being similar to the Orthodox Christian concept of ‘conciliarity.’ Is there a similarity? It’s more the compassion that the Fathers keep urging us to show, to love and go on loving. But yes, conciliarity is part of it. Majority rule is better than minority rule, but consensus beats both, and that springs from ubuntu, the desire to not shut anyone out. 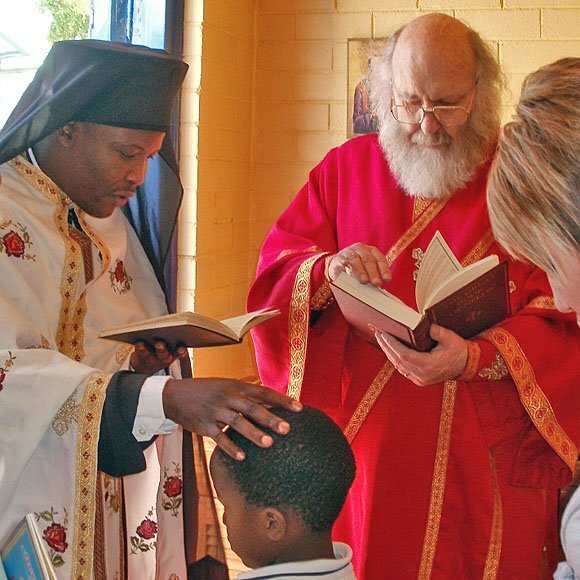 What do you think North American Orthodox Christians can learn from South African Orthodox Christianity? From South African Christianity? From South African history and culture? Perhaps a slightly different approach to the relations between religion and secular society? But I’m not sure, I haven’t had enough experience of American culture to know. And in South Africa, Orthodox culture hasn’t really got deep enough roots, so in a sense it is too early to say. How old is Orthodox Christianity in South Africa? Is it rooted in immigrant history, in indigenous movements like those in East Africa, or both? Orthodox Christians from other places, mostly Greece, Cyprus and Lebanon, began coming towards the end of the 19th century. The first bishop was appointed in 1924. There were some discussions between the leader of the African Orthodox Church, Daniel William Alexander, and the local bishop of Johannesburg, but, unlike in East Africa, not much came of them at the time. You are a non-immigrant (indigenous?) Orthodox Christian South African and member of the clergy, and I understand that you have relationships with a handful of primarily non-immigrant congregations. Did the growth of Orthodoxy among non-immigrant South Africans begin before or after the end of apartheid? Has the end of apartheid affected the way Orthodoxy has developed? It began shortly before the end of apartheid, manly because some of us knew about the African Orthodox Church and tried to make contact with them, though they had then split into several factions. We formed a mission society (the Society of St Nicholas of Japan) and made contact and then worked directly with the patriarch because the local bishop was not much interested. During the time of apartheid, all Orthodox clergy came from overseas, and were only given visas if they (and the bishop) signed an undertaking that they would confine their ministry to their own ethnic community. That was in accordance with the basic principle of apartheid with its notion of “own affairs”. That was one reason why we founded the Society of St Nicholas of Japan. It was founded by South Africans, so the government couldn’t deport us (as it could with most of the priests), and if they asked the bishop about us, he could disown us, and say we weren’t under him. North American Orthodox Christians are accustomed to overlapping jurisdictions, where a single city might have Orthodox congregations under five or six different bishops, all answering to their own synods or patriarchs overseas. In South Africa, I understand that all Orthodox Christians are under the same bishop, who is a member of the Holy Synod of Alexandria. Does this mean that congregations are generally of mixed ethnicity, or is there de facto ethnic segregation from church to church? There are various ethnic parishes, Greek, Russian, Serbian, Romanian and Bulgarian, but all fall under one bishop. Many of the ethnic parishes concentrate on one ethic community, using the language of that community, but, depending mostly on how mission-minded the parish priest is, some have outreach into local communities as well. Some of the parishes are “community” churches, run by an ethnic committee, which employs the priest, and those are less interested in what happens outside, and tend not to like it when the priest engages in what they regard as extra-curricular activities. Others, like the Serbian parish, are church-controlled, not community controlled (there was a bit of a fight over that), and it is the priest who encourages the laity to take part in mission, rather than the laity discouraging the priest. The church-controlled parishes are generally more open and mission-minded than the community parishes. And then there are mission congregations, established with local people and using local languages. Most of them were started after 1997. Article published in English on: 17-12-2014.